Vacation rental house. Sleeps 9, 3 bedrooms, 2 bathrooms. Dogs allowed. Turning around here is your beach! This home sits on a large piece of land with a large lawn that extends down to the water. This view is from the end of the land right next to the water looking back at the house. Coming back closer to the house you can see the deck and gardens. Welcome inside! You'll see a a lot of fantastic open space in this home, here between the dining room and the kitchen. Stepping down into the living room the classic island architecture and furnishings envelope you and give a cozy feeling. Open the double doors and you'll be able to feel the sea breeze. The living room offers a space to relax by the fireplace and game table or you can head out to the deck through the double doors. Another perspective of the living room area. 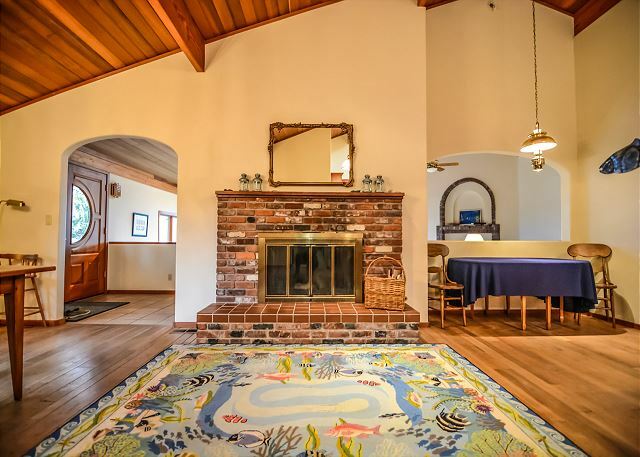 The dining room area is spacious with a large table and unique area rug in front of a brick fireplace. The kitchen can be seen at the back right. 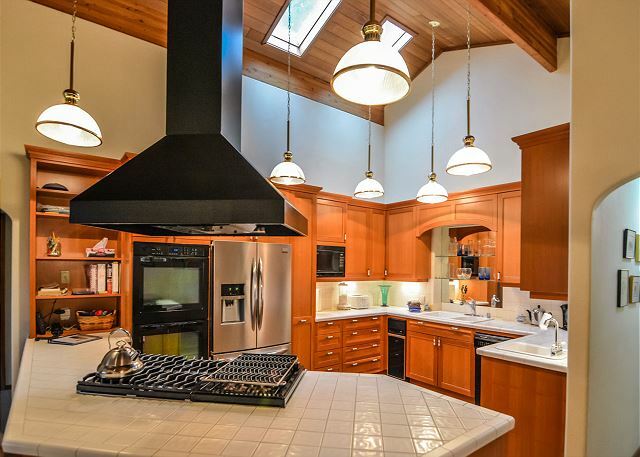 This beautiful kitchen has high ceiling with skylights and a floating hood vent for the stove. A close up view of the industrial grade stove with BBQ grill. The kitchen is spacious and well appointed throughout. The dinner table can seat ten comfortably. What a great lawn for croquet, badminton, and tossing a tennis ball to Fido. 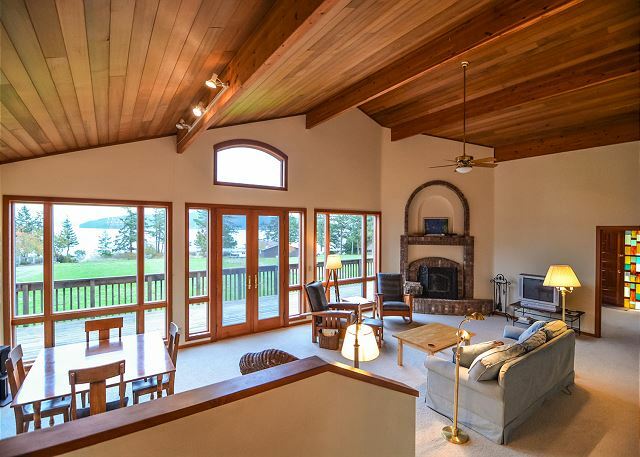 The deck and windows run the entire length of the living room. Moving to the bedrooms, the master bedroom offers a king-size bed and again lots of space and classic island styling. 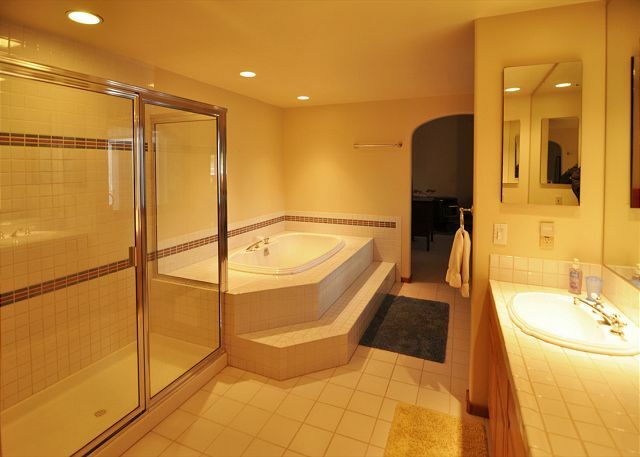 The master bath is large and offers a soaking tub, walk-in shower, dual vanities, and separate toilet. 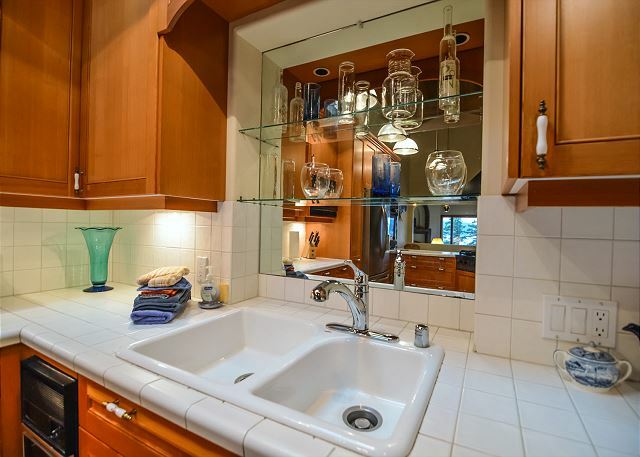 This large bathroom has a glass walk in shower, double vanity sink, and soaking tub. 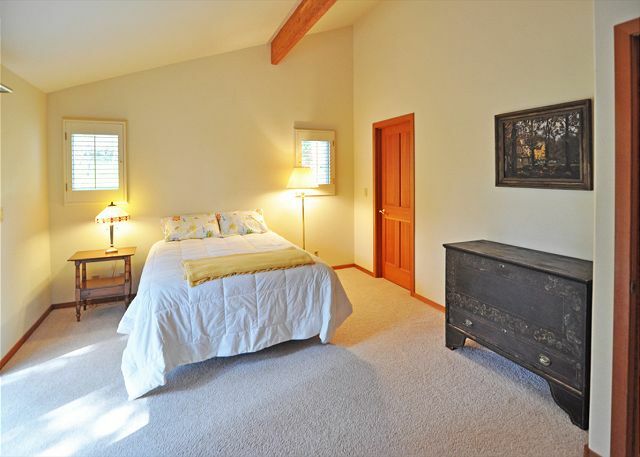 The guest bedroom with queen bed is cozy too. 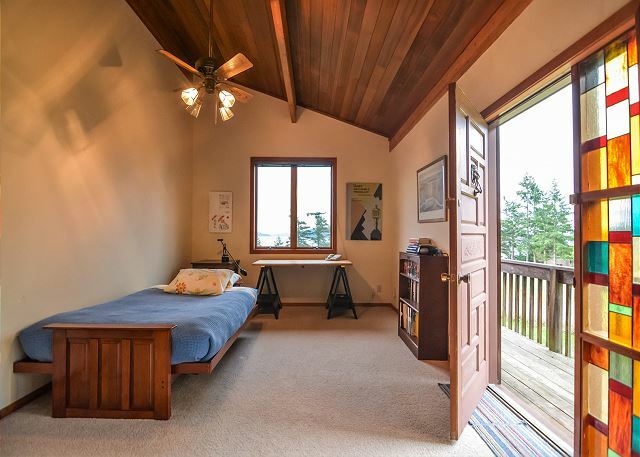 This room on the side of the house is spacious offers an additional bed and enjoys its own deck access. 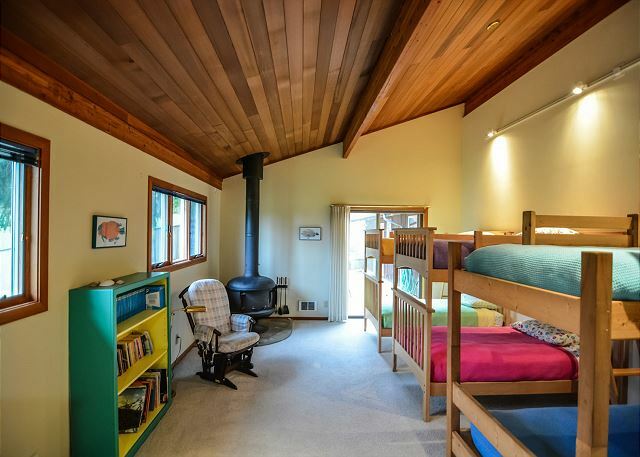 Three bunk beds makes this a very fun room for kids to enjoy. The back yard of Island Views is private and enclosed. Back outside, once you head down the lane to where the property ends at the beach you'll be able to see that the beach extends for miles in both directions. Come stay a while! Welcome to Island Views! This glorious setting mixes a tranquil pastoral location with beautiful ocean views. This wide grassy trail leads to a beach filled with driftwood and pebbles. 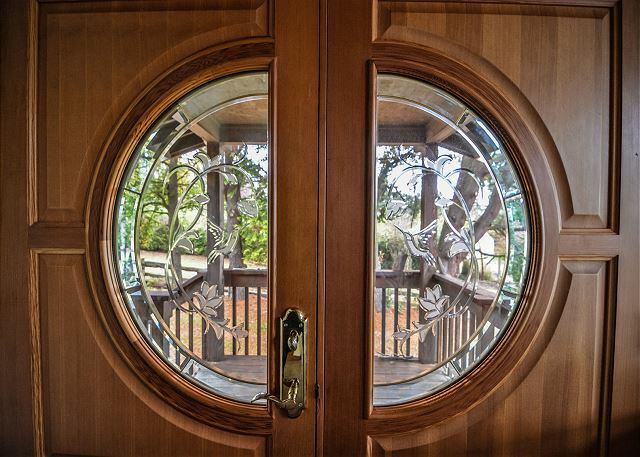 The gorgeous custom front door. 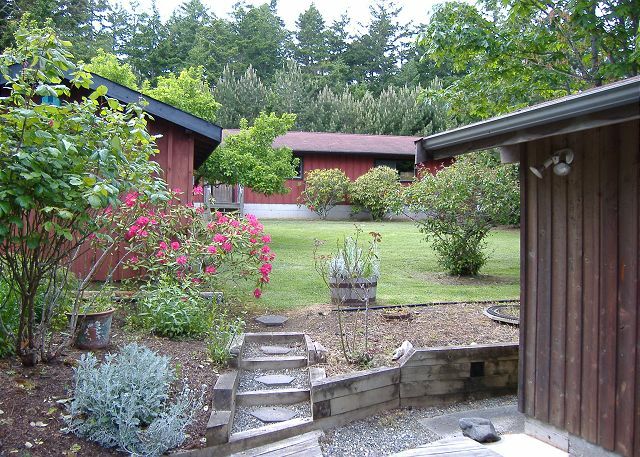 BEACHFRONT VACATION RENTAL HOME ON LOPEZ ISLAND - DOG FRIENDLY, TOO! 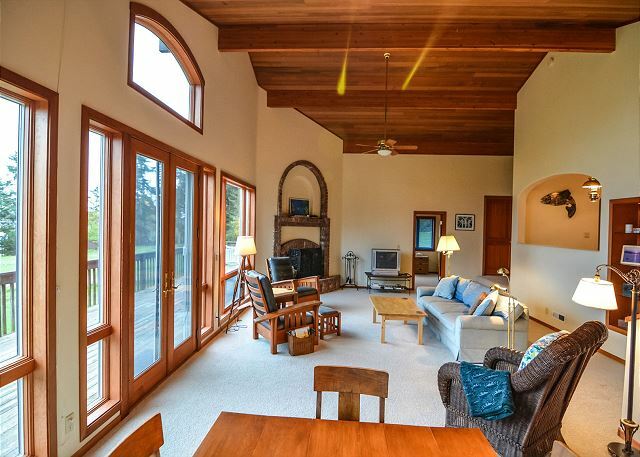 Bring friends, family, and the dog, you are going to have a fantastic vacation in this Lopez Island waterfront home! 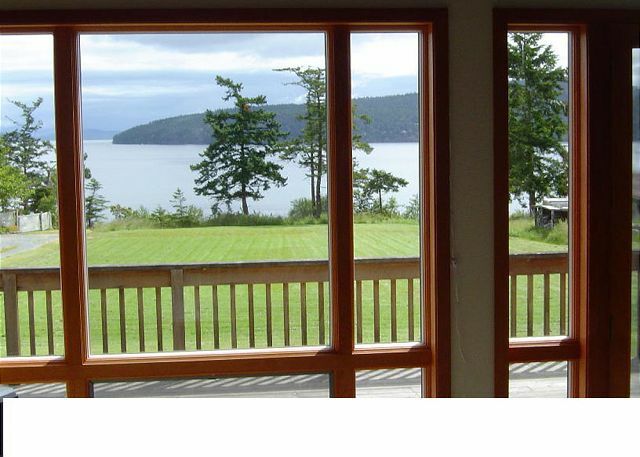 To start, there is a long pebbled beach with a great view of Mount Baker directly across the lawn in front of the house. The beach is shared with a few neighbors, but as it stretches for a mile or so in both directions, you can typically have a picnic, sit on a log, or wander about quite privately. Between the house and the beach there is a big grassy lawn that is wonderful for croquet, badminton, and tossing around a ball with the dog. The property has a completely fenced back garden area with BBQ and patio as well. A low deck runs along the entire front of the home, another space where you can sit outside to enjoy the sunshine. The home is wonderful for one or two couples, but as the floor plan is rambling and the rooms are spacious it is super for families, too. The living room opens to the deck and has a wood burning fireplace and game table. The den is just off the living room and it contains a desk and futon sofa that can be converted to a double bed. Up a step, there is a large area containing an open kitchen with great appliances, dining area with large table. The home has three bedrooms. The master bedroom has a king size bed, desk, and large bathroom with soaking tub, toilet compartment, and walk-in shower. The second bedroom contains a queen bed as well as a connecting bathroom. 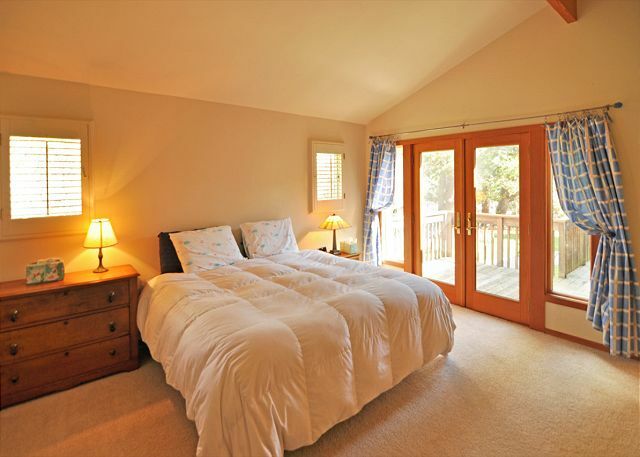 However, this bedroom additionally opens into the laundry room, so it can either be utilized privately from the queen bedroom or shared with others staying in the third bedroom. The third bedroom houses three sets of bunks for kids. You are also welcome to respectfully listen to the owners classic record collection from the 70’s and enjoy their collection of toys, board games, and lawn game equipment and enjoy the high-speed internet access. We felt at home right from the start: The young cousins found games and toys which they happily played with in the great bunk room. The older set enjoyed the spacious kitchen, living areas and great views. Everything was in good working condition and the appliances of good quality. The house was clean. We found that the front guest room only had a futon bed and it wasn’t close to the bathrooms; it’s not a good room for a senior. 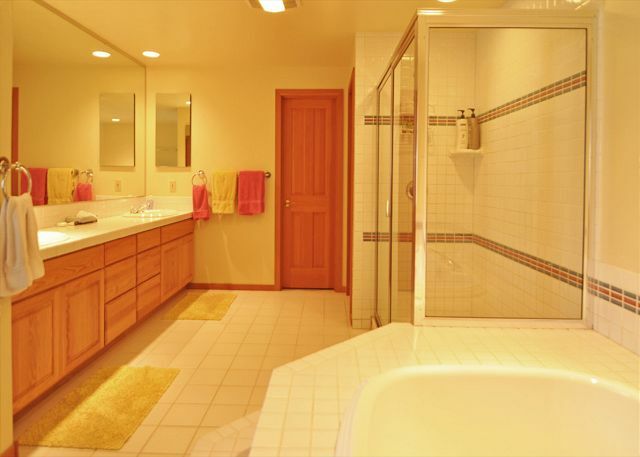 The largest bathroom would have been better if it had a door to close it off from the master bedroom. Other factors outweighed these inconveniences as we all enjoyed our stay and would stay there again. Very nice house, generally well equipped. Lots of public spaces. Really needs grab bars next to toilet and in shower. Difficult for a handicapped individual. We had a wonderful time staying here while we were on Lopez for a family wedding. The location is beautiful, quiet and peaceful. The house was very comfortable and well appointed. Only suggestion: add another bathroom. We had a wonderful early spring vacation at this rental. Clean house. Smells clean. Carpets look brand new. Fully furnished. Fully stocked with kitchen tools. We cooked every morning and evening and we found everything we needed, even an excellent hot plate for making pancakes! We were a couple and two of our young adult children and one dog. The beds were very comfortable. The neighborhood is quiet. The house is wonderful for a well-behaved dog, thank you for accommodating dogs, and thank you for the page of dog rules, we expect the same from our dogs at home. The fenced yard, dog towels, and extra dog bowls were very useful. Thank you for the wonderful binder of information about the island, the beach guide was wonderful, we went to every beach. There is a very large room with 3-4 bunk beds that we didn't use, this would be wonderful if you had a couple families with lots of kids. The only drawback is that there is only one bathroom outside the master bedroom. Only 2 bathrooms in total. So even though the house, kitchen, eating area, living room and yard could accommodate large family gatherings, the bathroom situation could be tricky. If we come to Lopez again, we would love to stay here again. We cleaned up after ourselves before we left and we got 100% of our security deposit back, thank you! I highly recommend this home as a vacation rental. Clean,spacious,well stocked and equipped with all you need for an enjoyable stay. I would stay again if in the area. Our grandsons loved the game and record collection. We loved this house! The location is ideal. It is close enough to Lopez Village to bike there easily, and Spencer Spit is only a mile away. The huge lawn with a view of the sound is awesome for playing games like badminton and volleyball! We brought our dog with and were happy to find out that there is also a fenced in area for your dog to run around a bit while you are home. The kitchen is awesome, with really beautiful appliances - especially for a rental. There are so many games to play, and puzzles to work on that you don't need to bring your own. The walk to the beach is very short, and although it is steep but we had no problem getting our kayaks down. You will see deer in the early morning and evenings. Also, a blue heron likes to sit down by the waters edge. Seals were spotted too! The beds are comfortable and it is very quiet at night here. The only thing that I would recommend for the owner if they plan on renovating in the future is that it would be great if there was one more bathroom, preferably not attached to a bedroom. Right where the game room is now would be ideal! We needed to house 9 wedding guests and family. Island View was beautiful and contributed to the joy of the wedding celebration. Getting up early for the sunrise on the front deck, watching the Washngton State Ferrys slip through the nearby passage and the deer nibble their way across the yard were highlights. The kitchen was amply supplied with extras that simplified our meals away from the wedding gathering. The kids enjoyed the many, many games and puzzles and the adults spent quiet evenings spinning LPs from a huge collection. Very fun. The beach was a bit of a hike but worth the effort. Beautiful house, and a very beautiful location. We had a great stay. As far as the house, everything was clean and tidy. Some light switches didn't work but it wasn't a problem. I do wish there were stairs to get from the path down to the beach area - that stretch from the grass down to the flat part of the beach is steep and dangerous. And we noticed that many nearby houses have stairs for this stretch. Lastly, I appreciate that pets are allowed but I think a $35/night pet fee is totally exorbitant. I've never paid more than $15 a night for a pet fee. Wonderful house for a family. Our second visit to this location. Our extended family had a wonderful time! We loved the eastern exposure and the big lawn where we enjoyed a 3 generation game of kickball. The large kitchen allowed workspace for several cooks. We sat comfortably at the long dinner table. 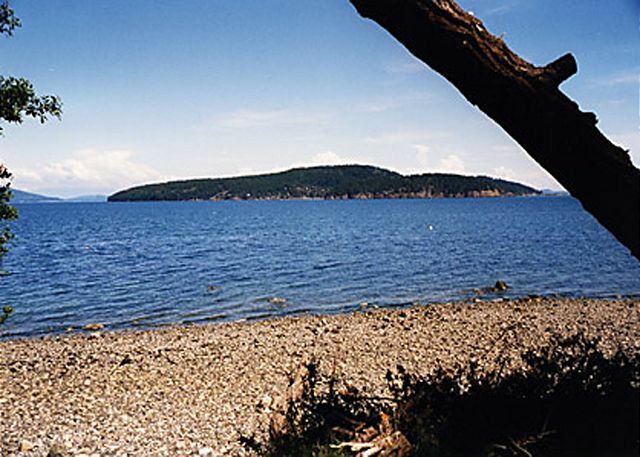 We've been vacationing at least a week on Lopez Island every summer for more than 12 years. Love it! This was perfect! Exactly what we wanted - calm, quiet, relaxing with plenty of room for the 7 year old to roam safely. Awesome place for family or friends get-together! Just as great as five years ago! We stayed here with two families (four adults, and four kids, ages 2-7) for five nights and had a great time. Day trips to different gorgeous beaches/hikes, and trips to pick raspberries and strawberries. Used our own Stand-up-Paddleboard to drop the crab pot off the beach in front of the house, and caught the limit in crab every day! Ate very, very well! The record collections is still super fun, and the puzzles provide a lazy-day activity while gazing at the beautiful view. If I had one recommendation, and eating table on the sea-side-view porch would be a great addition! Loved our stay and hope to be back again! We were very comfortable in this well equipped, beautiful home. The views are wonderful. The large, well equipped kitchen was a plus. Thank you for allowing us to bring our family dog. Finding a large home on Lopez that allows pets was tricky. This home answered our needs for our family get together. A memorable experience. We had a wonderful stay. Child friendly and a nice large kitchen and dining area. Proximity to the beach was a plus. Many thanks! This home is very nice and set up great for multiple families. The big kids room with the bunks & toys was great for the little ones to have their own space. Know that the beach is all rocks so difficult to spend much time especially with small children. The deck faces east so you don't get the afternoon sun. Other than that, it's a great home and close to town. We love Lopez and have made it an annual destination. We had 2 people and a dog. Had a fine time. However, a larger group would find the seating in the living room limited. Great kitchen. Very nice porch. We did not use it, but they have a fenced back yard. Fall in love with Lopez! 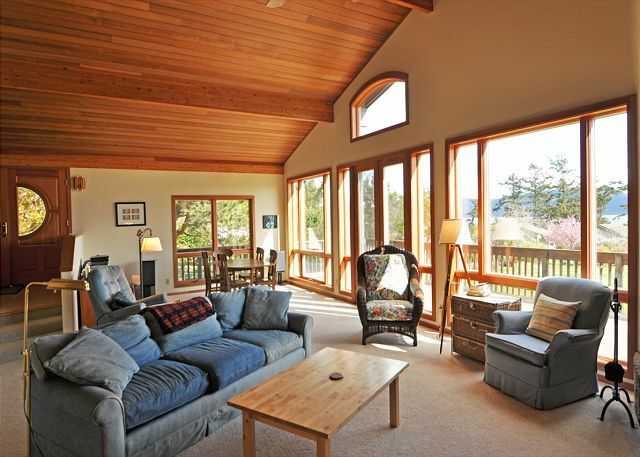 If you haven't already fallen in love with Lopez Island you sure are going to after staying at this fabulous home! My husband and I have been visiting the island for years and have always been searching for the perfect vacation rental and we have finally found it. We have stayed at many wonderful homes but nothing has compared to this. If you want to soak up all the peace and beauty has to offer you do not need to look any further than this deck and backyard. 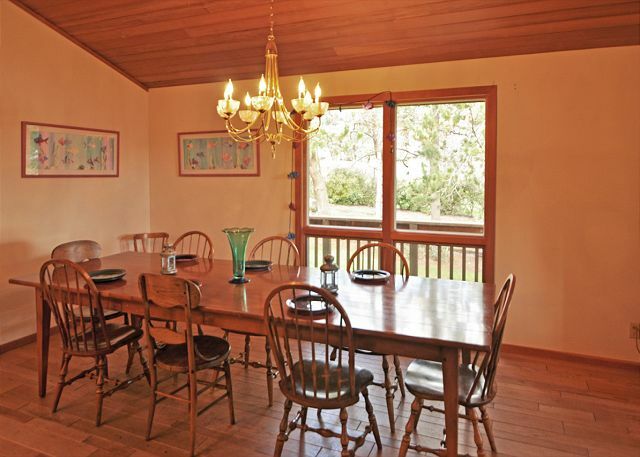 In addition it is a fabulous place for families and friends to gather and feel comfortable and spacious. Your furry friends can join you as well! By far the greatest vacation rental we have found on Lopez Island. Can't wait to come back for another visit! It was a perfect stay. Big home with all the amenities, a great record collection, massive lawn, gorgeous view, beautiful beach. A neighbor who loaded us up with fresh apples and string beans from his garden. Great weather. What more could you want? Great house. very spacious. french doors off living room and masterbed room did not lock. Although the house seemed a bit off the beaten path from town and at a distance from other family members who were renting on Lopez as well, the views, amazingly huge kitchen, single level enormous floor plan, and impressive record collection made this our favorite house so far that we've rented in the 10 years that we've been vacationing on Lopez. Unfortunately, the view is a bit downgraded by neighbors surrounding junk, and the house needs a good scrubbing and thorough de-cluttering--lots of clutter in the closets, kitchen shelves, and smattered throughout the house. Also, two bathrooms to be shared among 3 families had its challenges, and many of the linens are stained--towels had a lot of bleach marks, and some were ragged, and the comforter on the queen bed had blood stains. But the the idea of having multiple different colored towels is a great idea--everybody gets assigned a color! One final comment--replace the washer & dryer, they are dinosaurs and the dryer takes hours to dry one load! 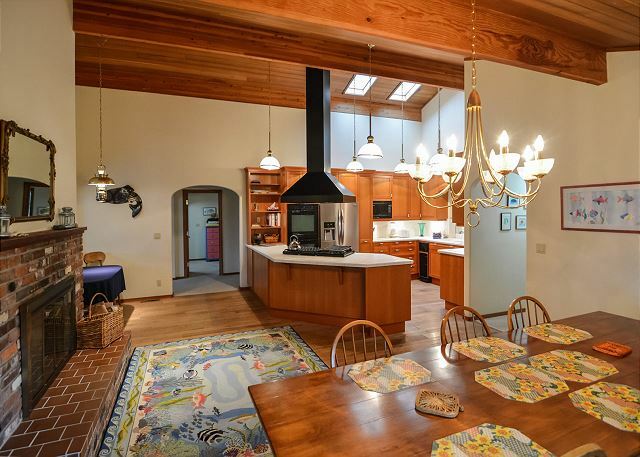 Overall, a great vacation home, responsive and organized property management team, plenty of space to carve out your quiet time, and beautiful water views! The huouse was a perfect place for a family of 7, all adults, great yard for crocquet and lovely beach to walk along and wonderful table to seat us all together. clean up the trees on the beach so you don't have to climb over them. a guest from Elgin, Texas does not recommend this vacation rental. Although the house was nice, it could have used a little sprucing up. Pretty bad stains on the carpets. Not a terrific view, as the house is pretty far away from the water. Would have been nice to have satellite TV, but we did appreciate the interenet access. The best things about the house were the great gourmet designed kitchen and the vintage vinyl record collection! Thanks to the office staff on Lopez who went out of their way to help me with some personal items. The location and accomodations were great! I loved the great spaces and indoor/outdoor games provided. The "beach" was located down a hillside which was a bit tough for some of our "older" guests but easy for most and provided a serene getaway. There is no TV reception but internet is provided and you could bring some DVDs as a player is provided. The option to rent 2 nights vs 3 will eventually drive us to the other properties on Lopez. Our group consisted of 33 people and 4 rental homes. I only organized 2. But the other folks were able to get a home just as big for less money and less days....that is our only complaint. Our group continues to grow each year for the annual tour de lopez trip and we have rented #116 for the last 4 years.... some folks have come early and it felt like we got our $ worth. But, if you could look into a 2 night stay with a later check out - at least noon we all like to sleep in - you'll probably keep our business. 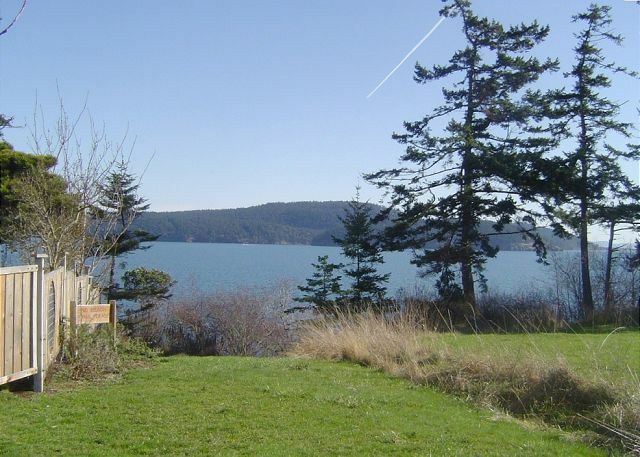 We regret that most of our Lopez Island homes do not accomodate 2 night bookings. Please let us know what works for your group early next spring and we will do whatever is possible to accomodate you. The vinyl records and turntable were a nice touch. The huge yard was great for kids to run around. This is our third year at this house and we had a wonderful time there, as always. I was surprised to find the house not as clean as it usually is - mostly the bathrooms (there was mold in the shower). But other than that, a wonderful home and another great visit. The management staff was extremely helpful!